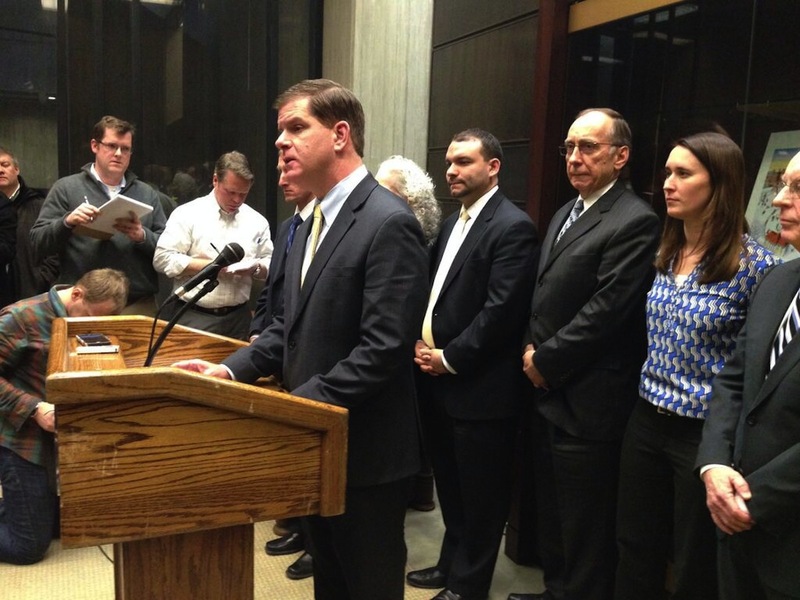 Boston magazine’s Steve Annear had it first in a blog post yesterday. He was supposed to wear the jersey at the U.S. Conference of Mayors, but he canceled the trip because of the snowstorm. Mayor Marty Walsh has the snow to thank for saving him the embarrassment of wearing a Broncos jersey in front of his fellow mayors from across the country. Citing the impending storm that’s set to drop up to 10 inches of snow in the Boston area through Wednesday afternoon, Walsh canceled his trip to Washington, D.C., where he was scheduled to attend the U.S. Conference of Mayors. And scheduled to wear the Broncos jersey at some point during the three-day conference. Waiting to hear from the Welsh Anti-Defamation League. Except there isn’t one. But this is a good Mike Royko piece. 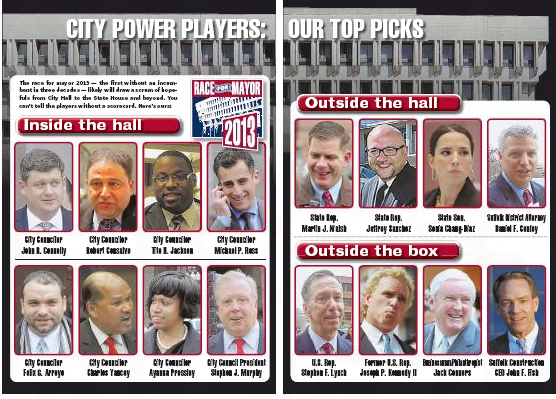 Both local dailies did a good job covering Marty Walsh’s inauguration as Boston’s 48th (or 54th or 58th) mayor. The Boston Globe gave it it nearly four full pages in the A section, along with the requisite sonorous editorial. The Boston Herald seemed to throw its entire newsroom at the torch-passing: eight columnists, seven reporters, twelve pages, and a cautiously optimistic editorial. 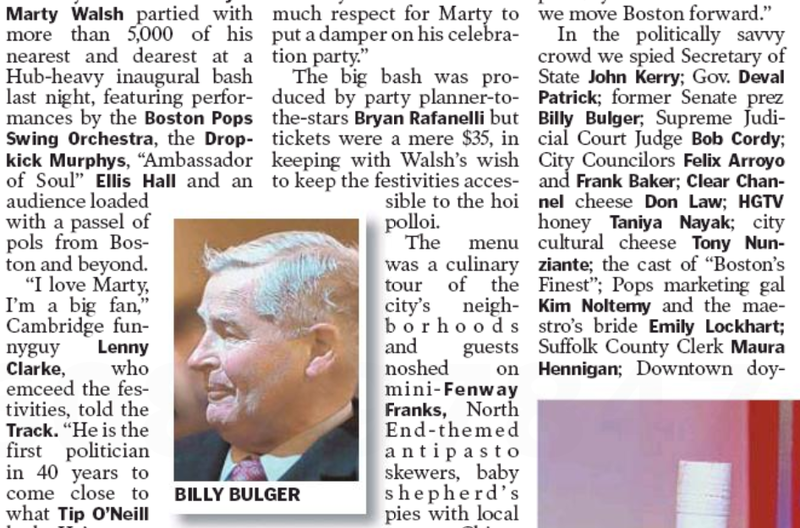 But, not surprisingly, it was in the boldface coverage of the day-long shindig where the Herald proved superior, especially in noting the less-than-luminaries who attended. Even some whose political legacies are shadowed by controversy showed up. Dianne Wilkerson, a former state senator, who was released from prison last fall after serving time for a bribery conviction, was in the audience. So, too, was Thomas Finneran, the former House speaker who pleaded guilty to obstructing justice in 2007, and former state treasurer Tim Cahill, whose trial on public corruption charges ended in a mistrial, probation, and a fine. Score one for the feisty local tabloid. Don Forst must be smiling somewhere.